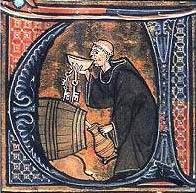 Wine has been produced in Languedoc for more than 2000 years. The Greek, Phoenicians and later the Romans, established colonies to produce wine and oil here. 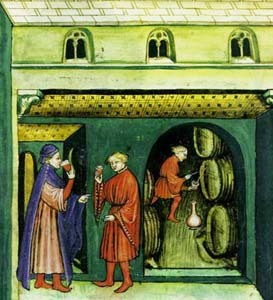 The Roman historian Titus Livius was lauding "wines of light" from Limoux two thousand years ago. In later times the area produced high volumes of poor quality wine to blend with the strong wine imported from the North African colonies. During the 1960's the vines were replanted with the high volume, stronger, but still undistinguished Carignan grapes. With the worldwide excess production of wine, vignerons in the Languedoc area have been replanting with varieties intended to produce better quality wines. Producers from California, Australia, New Zealand, South Africa and elsewhere are currently buying up vineyards because of the terroir and the cachet of a French label. Increasingly, Grenache, Syrah, Merlot, Cinsaut, Mourvedre, Sauvignon, Viognier and Chardonnay are used for wine making along with traditional grape varieties like Chenin blanc and Mauzac. 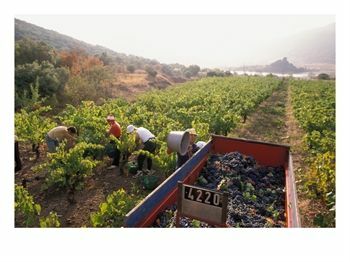 The Languedoc has now become a respected producer of quality wines. Many domains produce wines that command high prices. As in historical times, production of sweet wines, such as Muscat de Lunel and Rivesaltes continues along the coastal plains. As you drive around the Languedoc, you will see numerous signs reading "dégustation". The word originally denoted the art of recognising a wine, its place of origin, quality, and age just from the taste, but now it just means free tasting. You can stop and taste wines at these places, and if you like what you taste you buy direct from the producer, sometimes at a significant discount. If you want to find out about what is currently recommended in the region, buy a copy of "Hachette" - it reviews the wines every year and provides reasonably comprehensive information about them. The present Languedoc represents the southern half of the area covered by the ancient Roman's first province outside Italy. The northern part is now called Provence. The Roman's planted vines throughout their new province, so the Languedoc and Provence share a common wine-growing tradition stretching back over two thousand years..